Nidoran in game: 4,082 Who? Important notice! Pokemon Nidoran is a fictional character of humans. He evolves into Nidorino starting at level 16, which evolves into Nidoking when exposed to a Moon Stone. 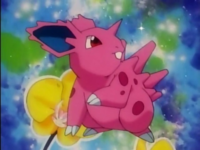 He is related to Nidoran♀ and can produce Eggs that contain either Nidoran♂ or Nidoran♀ when bred with Ditto. Nidoran♂ is a small, quadruped rodent-like Pokémon. 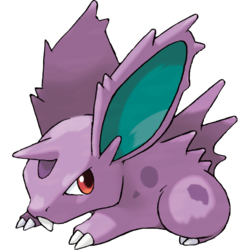 It is pinkish purple with darker spots, and has large, spiny ears with teal insides, oversized front teeth, and red eyes. Its back is covered with three lines of large spines that can release potent poisons if threatened. The center line of spines is taller than the other two. The size of the long, pointed horn on its forehead is indicative of the strength of its venom. Nidoran♂ is an exclusively male Pokémon, Nidoran♀ being its female counterpart. Ralph owned a Nidoran♂ which evolved into a Nidorino after kissing Emily's Nidoran♀ in Wherefore Art Thou, Pokémon?. In Leading a Stray!, one was part of a Luxio's group. Nidoran♂ first appeared in Pokémon Fashion Flash. A group of Shiny (due to a coloring error) Nidoran♂ were seen at Professor Oak's Laboratory in Showdown at the Po-ké Corral. A Nidoran♂ under the ownership of an unnamed Trainer appeared in Bad to the Bone. A differently patterned Nidoran♂ appeared in Poké Ball Peril. 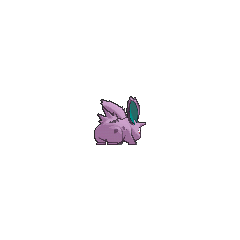 A pink Nidoran♂ appeared in In the Pink. Team Rocket tried to capture him along with his female counterpart until a pink Nidokingchased them off. Nidoran♂ also appeared in The Power of One. A Nidoran♂ and a Nidoran♀ were cuddling behind a bush in The Chikorita Rescue. A Nidoran♂ along with a Nidoran♀ briefly appeared in Going Apricorn! at Professor Oak's Laboratory where they were being fed by Tracey. A Nidoran♂ was one of the Pokémon stolen by Butch and Cassidy in The Fortune Hunters. 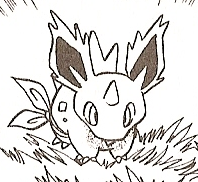 Nidoran♂ also appeared in Celebi: Voice of the Forest. A Nidoran couple were among the inhabitants of the Dragon Holy Land in Fangs for Nothin'. 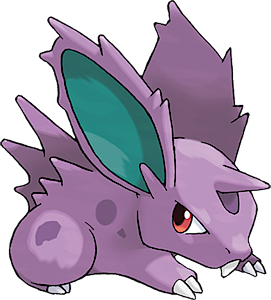 A Nidoran♂ was one of the Pokémon seen at Professor Oak's Laboratory in Showdown at the Oak Corral. Multiple Nidoran♂ appeared in the opening of Destiny Deoxys. Nidoran♂ appeared in Lucario and the Mystery of Mew living in the Tree of Beginning. One also appeared in Pokémon Ranger and the Kidnapped Riolu! Part One. A Nidoran♂ appeared in Cilan's demonstration in Mystery on a Deserted Island!. 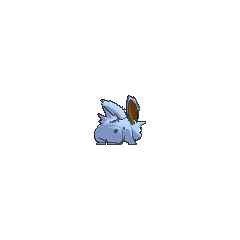 A Nidoran♂ appeared in a flashback/fantasy in The Forest Champion!. Multiple Nidoran♂ appeared in Diancie and the Cocoon of Destruction. A Trainer's Nidoran♂ appeared in Alola to New Adventure!, during a flashback. A Nidoran♂ appeared in SM003, as a silhouette. Nidoran♂ first he appeared in Just a Spearow Carrier belonging to Wilton. Green attempted to trick the man into trading his Butterfree for her weak Weedle because his Pokémon was infatuated with her female Nidoran. Red was able to stop her from carrying out this plan, however. Another Nidoran♂ appeared in The Last Battle XIII as one of the Pokémon sent to help the fight in Ilex Forest. Nidoran was the first Pokémon to feature gender differences, and even gender; however, their difference is much greater than most later Pokémon. Nidoran♂ and its evolution share their category with their female counterparts Nidoran♀ and Nidorina. They are all known as the Poison Pin Pokémon. Nidoran♂ appears to be based on a porcupine, rabbit, mouse, or a hamster, as seen by their aggressive nature towards one another.